The following highlights selected products and projects of those I had been delighted to work on at Shutterfly between 2009-2010. 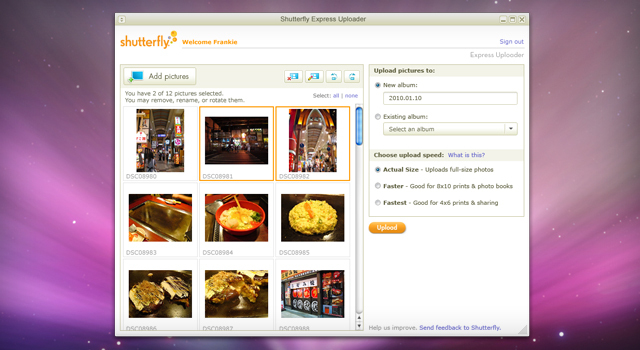 Express Uploader</a> is Shutterfly’s first desktop photo uploading application. This new application enabled its users to upload bulk of photos with reduced waiting time. Users can even rename or rotate photos prior uploading, which saved them hours of photo editing time. With the faster and easier method to get photo content uploaded to Shutterfly server, users are able to stay engaged with creating their Shutterfly projects which led to better ROI for the company. Working closely with user experience designer and against the design style guide, I was responsible for visual design for all the scenarios and flows for this application.